Sinusitis is a problem that is faced by millions of people across the world. When you suffer from sinusitis, you have to be careful when there is a change in season, as it can make your nose feel very irritated. Sinusitis may be acute (staying for less than 4 weeks) or chronic (staying for more than 4 weeks). Here the lining of the sinuses get inflamed. Here are air pockets in different parts if the skeletal system and the facial bones have three pairs of sinuses. They are hardly noticed when they are dry. When you suffer from sinusitis, these air pockets become filled with liquid and bacteria, virus or fungi. This is painful and cause you discomfort. Pain around the eyes, cheek bones and the forehead. Congestion of the nose and discharge, which is yellowish green in color. Loss of sense of smell and taste as well if the condition prolongs. Redness of the eyes as well as watering. Sinusitis is a very painful infection and you will be glad to get out of this trauma as soon as possible. You can treat it with antihistamines, antipyretics and pain killers under the advice of the doctor. They also tell you to steam and have proper rest. In extreme cases, the fluid from the sinus is drained out surgically. There are some hoe remedies that you can try to get rid of this infection. If it does not go even after one week of trying these remedies, then you can visit your doctor. Not only the weather conditions, but house hold chemicals can also trigger sinusitis. Deodorants, passive smoke, house hold cleaners, pet hair, hair sprays etc can intensify sinusitis. So, if they are responsible for your infection, remove them and use some organic products’ instead. When the air is dry, sinusitis becomes aggravated. So try to stay in a room that has enough humidity. But too much of humidity is also bad, as it forms a good breeding ground for microorganisms and makes things worse for you. If you use a humidifier, make sure that you keep it close to your bed. If you use a vaporizer, use it at least 3 to 4 times a day. This helps in keeping your nasal passage moist. This infection is caused due to different reasons in each person. Some of the factors that trigger sinusitis are exposure to sun, hay fever, cold, allergies and so on. When you contact this infection, you have to see what triggers it and avoid anything that can lead you to it. This has its origin from Indian yoga. Take a syringe and fill it with cool or tepid water, to which common salt is added. You may also add a pinch of soda to remove the sting of salt. Stand over a sink and flush your nostrils gently with this water. Try not to blow your nose too hard, as it can dry the sinuses and cause severe pain. This is an excellent remedy for mild sinusitis infections. Take boiled water in a utensil and inhale and exhale the steam. Cover your head and torso, along with the pan, with a thick sheet. After you steam for 5 to 10 minutes, lie down for 10 minutes with the sheet still covering your head and chest. This is an excellent way to get relief from this infection. When your nose and the sinus get dry, sinus infection is aggravated. So, try to avoid sun when the weather is hot and dry. When you heat your room during the winter season, make sure that the temperature is not too high in the room. It is better if you keep the room temperature slightly low and use woolen clothes rather than increasing the temperature. Water is always a must for your health. Drink at least 8 to 10 glasses of water daily. This can get you relief from sinusitis. You may also have hot fluids like soups and tea. Have hot showers or steam. All thee keep you hydrated. Coffee and alcohol make your throat and nasal passage drier. Black or herbal tea is great for treating sinusitis. You can add garlic, thyme leaves, sage leaves, lemon juice, cinnamon powder, ginger and lemongrass leaves to tea. Sip it slowly when it is still warm. Do not add nay milk or dairy products as they can trigger allergies and aggravate your sinusitis. Neti pot is a small tea pot having a long and thin sprout. Take distilled water at room temperature in this pot and add some common salt to it. Now you have to tilt your head sideways over the wash basin and pour the water through the sprout in the nostril facing up. This will flow from the upper nostril and drain out through the second nostril. This provides you relief from the pain and also disinfects the sinus. It keeps your sinus humid as well. In the beginning you may find it difficult but with practice you will be able to do it properly. 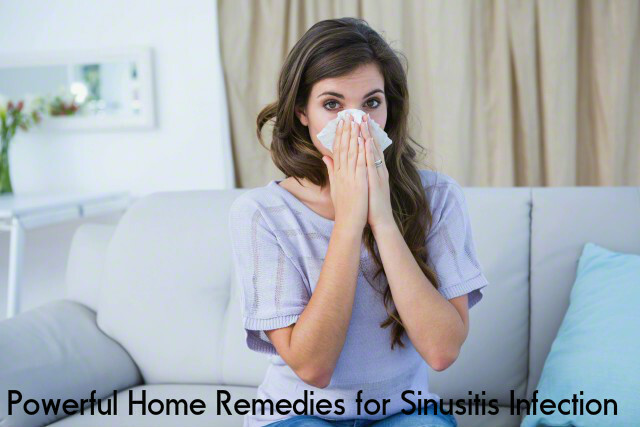 If you are living in an air conditioned house with its doors and windows shut, a lot if infections other than sinusitis can thrive in your house. So, it is important that you allow fresh air to get inside your house by opening the windows at least for 30 minutes. You can do so when the weather is warm. If you are in a 24/7 air conditioned office, it is not possible to open the windowed, but you can go out and get fresh air during your break. Slice an onion and wrap these slices in a gauze or light cloth. Tie this around your neck at night, before you go to sleep. Onion has antibacterial and anti-inflammatory properties, which can provide you relief from headaches, stuffy nose and blocked nose and ears.